Dr. Jeffrey Edelstein - What is Ptosis surgery? The term blepharoptosis orginates from the Greek roots “blepharon” (eyelid) and “ptosis”, (a fall). However, the more common term “ptosis” is used interchangeably with blepharoptosis to describe droopy eyelids among most practicing ophthalmologists. The most common cause of “droopy” eyelids is from excess tissue (skin and fat) that creates a heavy appearance and weights the eyelids (mechanical ptosis). When skin extends beyond the upper eyelid margin (hooding) it may interfere with vision, particularly from the upper half of the visual field. The levator muscle that lifts the eyelid may weaken or fail (myogenic ptosis). Finally, the nerves that supply the levator muscle may be dysfunctional (neurogenic ptosis). The treatment of droopy eyelids depends upon the underlying cause(s) and requires a thorough examination to consider medical and/or surgical approaches. The timing of ptosis repair in children also depends upon the visual development. In all cases, the treatment of blepharoptosis is directed by the amount of eyelid movement. Frequently, normal eyelid movement may allow an eyelid height and contour that clears the pupil with good symmetry. In these cases the tendon that lifts the eyelid is typically “tucked”. However, when eyelid movement is less than optimal, the decision of how to lift will be determined by a number of factors including the stability of the tear film, the position of the lower eyelid, your general health and need for symmetry/visual field. When eyelid movement is poor, a tendon tuck may not be adequate and it may be necessary to use the brow muscle to obtain adequate lift. Ptosis surgery is best performed as a “team sport” with you helping the surgeon by opening and closing your eyes to evaluate the eyelid height and contour during surgery. Fortunately, the eyelid will be “numbed” prior to surgery, while you are sedated. 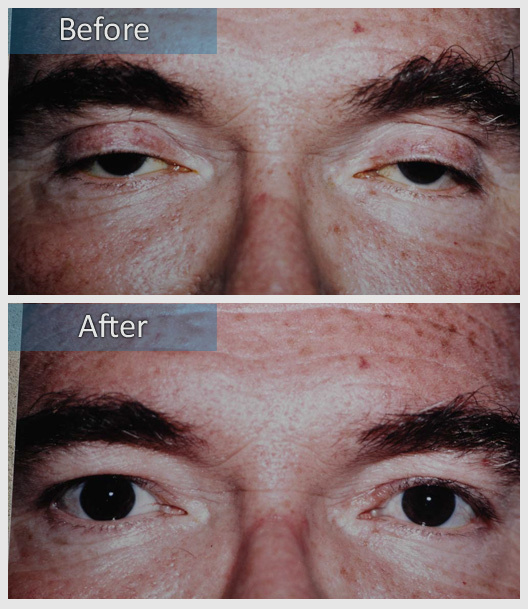 Most people find ptosis surgery a comfortable and pleasant outpatient experience. 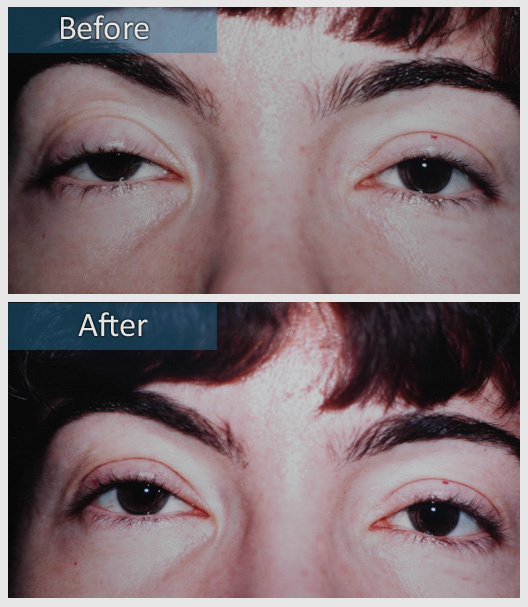 When necessary, ptosis surgery may be performed with you completely asleep (general anesthesia). The amount of swelling and/or black and blue depends upon a number of factors but is minimized with ice compresses for the first 48-72 hours. The bulk of swelling resolves after two weeks, but some may be present for as long as six weeks after surgery. There are normally three post-operative visits; the day after surgery to ensure there are no structural problems, the week after surgery to take out sutures and the month after surgery to take final photos.